Celebrating their 40th Anniversary as a band, New Orleans’ The Radiators release WELCOME TO THE MONKEY HOUSE, their 20th album overall. Their first studio album in roughly a decade, WELCOME TO THE MONKEY HOUSE is a welcome return for the band that also serves as a reminder of their much-missed talents. While the band no longer operates as a full-time outfit, all the original members reunite each year to play the New Orleans Jazz & Heritage Festival. Instead of letting their 40th Anniversary pass them by, the band decided to head back into the studio and record a handful of new tracks mixed with a healthy dose of songs that have littered their live set for decades but have never made it to an album! 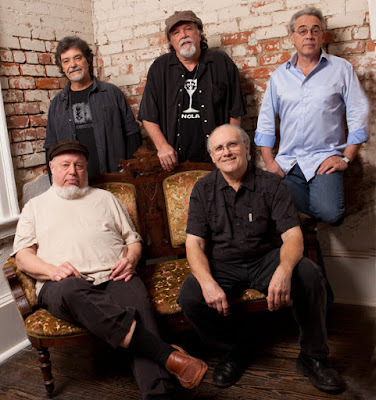 Known as both The Radiators AND The New Orleans Radiators (thanks to all the other bands that have decided to use the Radiators name over the years), this group of seasoned pros has created an album that is relaxed, warm and a whole lot of fun. Once thought of as N’awlins’ version of The Band, The Radiators play their own unique brand of blues which includes elements of Soul, Folk, Jazz, Funk, Pop and Rock. Their fans call themselves Fishheads (because of The Radiators use of fish in their iconography). And much like Deadheads, their fanbase remains dedicated. WELCOME TO THE MONKEY HOUSE is just as much a fan’s album as it is a new addition to this band’s impressive back catalog. More like a rollicking house party than a blistering Blues bash, WELCOME TO THE MONKEY HOUSE is an album that is bereft of pretension. This is music created by a group of friends – Ed Volker, Dave Malone, Camile Baudion, Reggie Scanlan and Frank Bua – that celebrates a lifetime of music, friendship and that groovy New Orleans vibe. It is an album that is rooted in reality and isn’t afraid to be raw and loose if that is what the occasion calls for. Come in and enjoy the vibes… and watch out for that voodoo, chile!